We want you to have the BEST photo booth rental experience EVER! 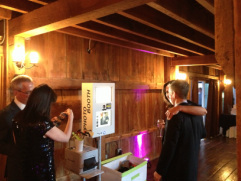 We think that a photo booth should be a place where your guests gather, mingle and laugh. It's contagious. The more that people are laughing, the more other people want to come over and join in the fun. Its amazing and happens all the time. We don't see this same reaction from a "closed in" box style booth. That's why The Laugh Pod is completely open. We want guests to see it and see each other. We like to think of our modern, ultra-cool photo booth as "industrial chic." The ability to blend into any event means your guests are not struggling to fit into a box. Fun is what it's all about. Gathering of many guests to one area creates fun, talking, interaction and excitement. What is The Laugh Pod? HG Entertainment. We also offer The Smile Lounge for those times you may want to separate The Laugh Pod from the rest of the event. If you're looking for something fun for your event THIS IS IT! The Laugh Pod captures the imagination of your guests, creates a buzz, allows guests to interact and have fun, and most importantly leaves a lasting impression. A wonderful thing happens with The Laugh Pod - people relax, and just have fun. The result is really natural and very funny pictures - a record of the unique atmosphere of your event. Stand in front of The Laugh Pod. Hit the button, and automatically 3 or 4 photos are taken. Say Cheese. Enjoy your beautifully printed photo in about 12 seconds. How cool is that? Instantly share your photos via Twitter, Facebookor Email. Instant gratification without wasting paper.